We love fairies, yes we do! Fairies are my favorite. If for some reason you're not down with fairies, then just move along and don't tell me. I only want to live in a world where people believe in fairies. 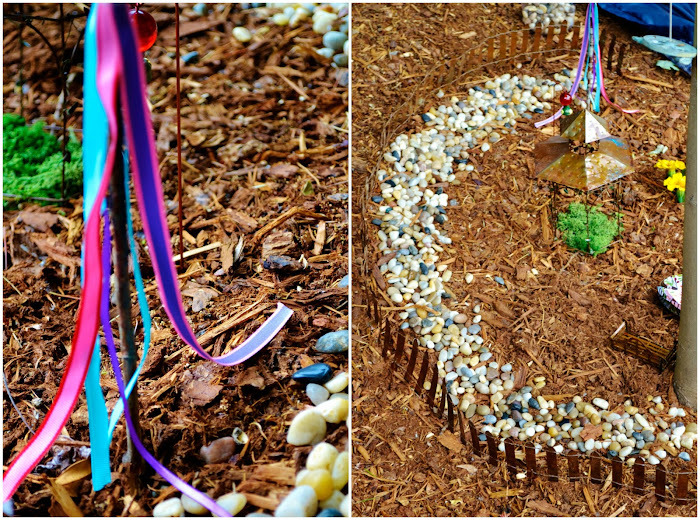 Julia and I have been planning a little fairy playspace in our yard for ages. Seeing as how I am not the craftiest of people, I cheated a bit. Yeah, I'm sure Pinterest is just FULL of pictures of people's creations of fairy houses that are totally natural and made from bending twine and sticks of wood into real-life log cabins and whatnot, but that's all just too much for me. I got a fake mossy knoll. I LOVE MY FAKE MOSSY KNOLL. 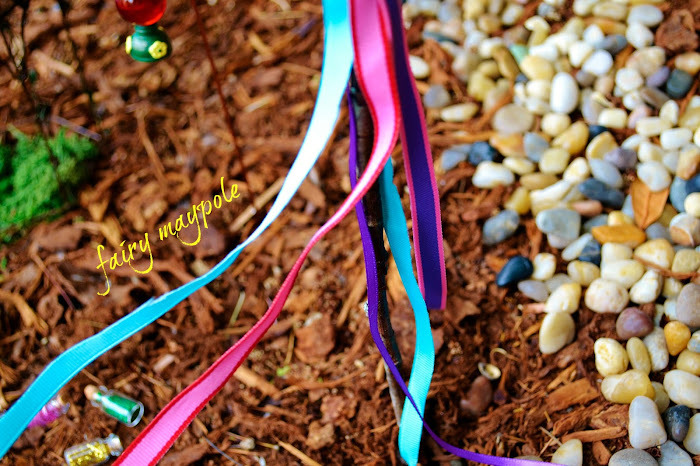 I did however, construct a fairy maypole from a stick, tape and ribbons. I LOVE MY FAIRY MAYPOLE. We got our hands upon some tiny bottles of glitter, also from our garden store. When it runs out, we can just refill them, because if there's one thing I have an unending supply of around here, it's glitter. We made placemats from rose petals. They are fabulous. They will wilt. We will put down more. And Julia made a little fairy store, out of an old piece of cardboard, which she painted. Then she glued bark chips onto it to make shelves. She also painted dried leaves to make fairy boats. She is waaaay more crafty than I am! My kiddo and I had fun planning and constructing this thing out for about two hours. This child doesn't spend two hours doing anything, unless she's asleep. So I would call this activity a monumental success! The next day, we discovered that the fairies had bought two bottles of glitter and left two dimes as payment. And they had totally played with the fairy maypole! We're going to keep adding to it over the summer. I need a hot glue gun because I want to make a ladder made out of sticks. I'm going to hot glue my entire backyard. It's going to be SO AWESOME!!!!!!!! I love fairies. this is amazing. I love the tiny glitter bottles! Gah! I'm on cute overload!!!! 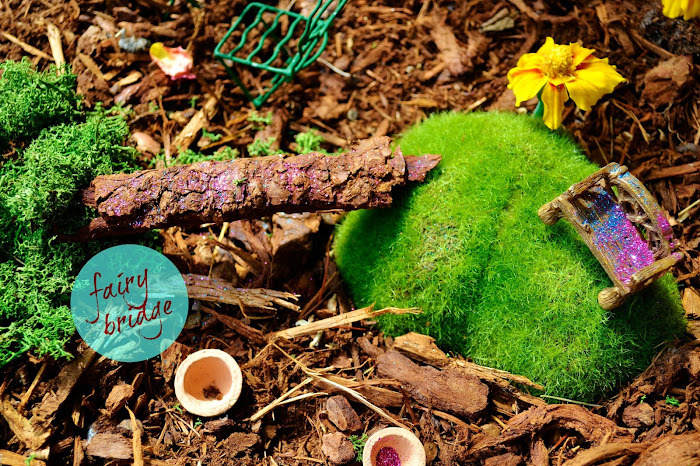 This is seriously the cutest fairy garden EVER!!! oh I'll tell you where there are some amazing fairy gardens, there's a site called Magic Onions, they have a fairy garden contest from April to Aug I think, I'm going to enter this year! But there are some super cute ones, with houses and everything! Gorgeous! I'm so jealous. My backyard needs so much work, I have no place to do this right now. So sweeeeeet!!! I love the maypole! Brilliant, Melissa. This is so cute! We made a Christmas garden awhile ago, but it's in need of a facelift! I'm also wondering if you can tell me where you got your blue line drawing for your website's background? I love it! That is a success. What darling photos. I love tiny store ANYTHING. :) But hey Miss Samantha, we got nothing on you! That fairy house you did a couple years ago was pure epic brilliance. The maypole rocks!!! So much! I think I've told you this before but my friend has some woods near her house and she has a whole fairy land down there! And she does birthday parties for her kids, and the fairies put out nectar and tiny cupcakes and leave gifts for the kids (which usually are reflective of a variety of holiday super mega clearance items, because fairies are thrifty) and it is the most fantastic thing ever--- unless you are my husband who thinks it's totally ridiculous, or any man for that matter-- but really it's like a little girl's dream come true! I told her I want to post it!! 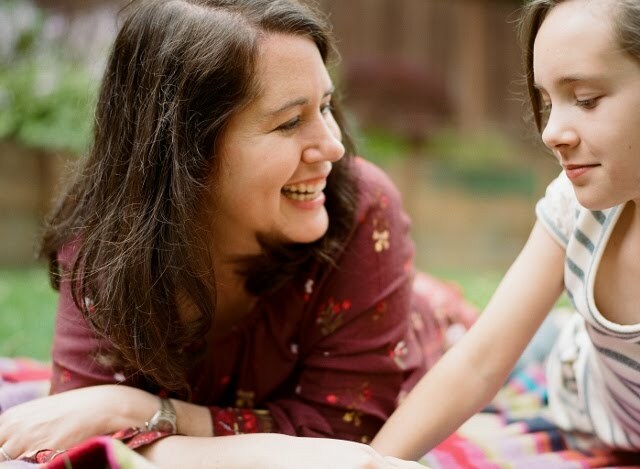 Oh my gosh, please convince her to let you put it on your blog!! LOVE! Can't wait to do this with L and the new little one when they are older!! Oh you will have SO MUCH FUN, Rebecca! !